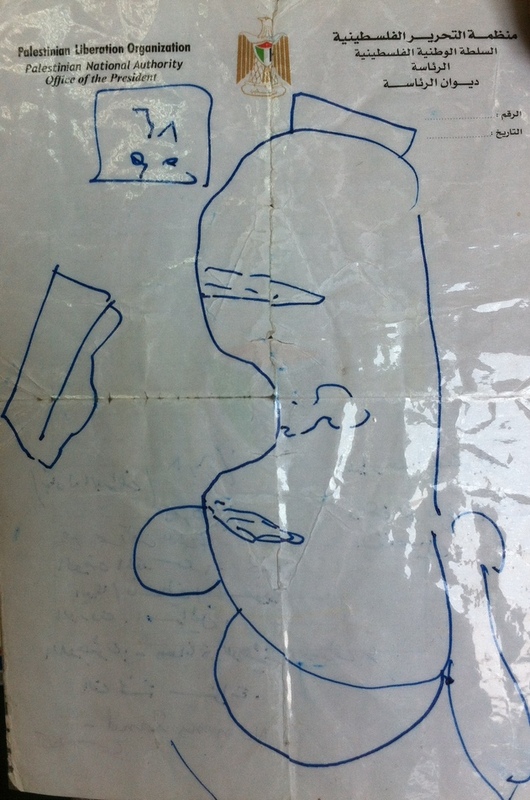 This is an exclusive [not ours, but of Israeli journalist Avi Issacharoff, who reported it in The Tower, here] — a map reportedly hand-drawn from memory by Palestinian President Mahmoud Abbas on 16 September 2008 upon his return to Ramallah after meeting Israel’s then-Prime Minister Ehud Olmert. But Issacharoff’s story [w/ the Abbas map exclusive] could have the effect of bolstering Abbas’ position that talks should restart at the point they broke off in September 2008 — in other words, on the basis of the proposals made at the time this map was drawn. The current Israeli Prime Minister Benyamin Netanyahu has refused to start talks on this basis. But, the concrete confirmation of the discussion on 16 September 2008 in the Prime Minister’s residence in Jerusalem, could somehow facilitate the restart of the direct negotiations. This map, which Issacharoff said is the one drawn by President Abbas, is a map of Israeli proposals for Land Swaps — an idea that evolved out of the Geneva Initiative signed in December 2003, in Geneva, between Israeli and Palestinian “civil society” teams. The Palestinian team insisted that the Land Swaps be on a 1:1 basis — and this was agreed by the Israeli team of unofficial negotiators. It was the one concrete Palestinian achievement through the Geneva Initiative. The Palestinians additionally scored another point through the Geneva Initiative negotiations: the Land Swaps should be of land of an equal or greater “quality” [i.e., not rubbish or poor-quality barren wasteland]. The Abbas-drawn map shows, inside the West Bank, only the 3 large settlement blocs that have been under discussion between Israels and Palestinians since 2000-2001: Ariel, Gush Etzion, Maale Adumim. It also shows, outside the West Bank, what must be proposed areas of land swaps: 1.) North of the West Bank; 2.) at the Tarqumiya area just to the West of the Tarqoumiya area [where the terminal for the two-way safe-passage route planned between Gaza and the West Bank was/is to be located] ; and 3.) South of the West Bank. The Tarqoumiya area was/is supposed to be the terminal for the two-way safe-passage route that was supposed to be already operating already, for years, between Gaza and the West Bank. NOTE: The Palestine Papers, leaked documents from the Palestinian offices including from the PLO’s Negotiations Support Unit, show that in a meeting in June 2008, three months before the final Olmert-Abbas meeting on 16 September 2008, Tzipi Livni said: “The 7.3% offer by Olmert is the most generous, and will be perceived by Israelis as the most fair”. In that same meeting, Ahmad Qureia [Abu Alaa] stuck to the same 1.9% that Palestinian negotiators are still standing by today, and said that “7.3 position just does not allow a state to survive, and it takes all around Jerusalem, and gives to the south of the West Bank and next to Gaza”. This revelation is published here. Another of the Palestine Paper documents describes Israel’s position in July 2008 as: “Olmert’s proposal to AM [Abu Mazen, or Mahmoud Abbas] of 7.3% of West Bank (excl. East Jerusalem, No-Man’s Land i.e, 9.2%) in exchange for 5% equivalent from Israel in southern West Bank and around Gaza…” The same document also notes: “Not allowed to present GoI [Government of Israel] position on swaps”…And it also says “Willing to discuss swap but not 1:1 in quantity. Palestinians do not have ‘rights’ to the land and Israel is not under obligation to ‘return’ land to Palestinians”… This is published here. On 15 July, a Palestinian team led by Abu Alaa was in Washington to meet Concoleezza Rice. According to the meeting notes, published by Palestine Papers here, Abu Alaa told Condi Rice: “We offered 1.9%. It is reasonable. We included the settlements inside Jerusalem – Psgat Zeev, etc. It’s the first time! … East Jerusalem is part of the 1967 border. Anything there should be part of the swap. Unfortunately, what we heard from Olmert is that he can’t stop building because it is Jerusalem”. Condoleeza Rice reportedly said: “Ariel is a problem, I told them – it protrudes down far into the Palestinian state…Also it would be difficult for Israel to protect Ariel without a large perimeter”. I was shown a map very similar to the Abbas map in January 2001, in a Ministry in Ramallah — before the era of “Land Swaps” — and it showed only the West Bank with the three areas that Israel calls “settlement blocs”, minus any Israeli land that was on offer for a trade. In other words, in late 2000 + 2001, Israeli negotiators working for then-Prime Minister Ehud Barak were proposing that they keep the three large settlement blocs marked on the map — but they were not proposing to give up any territory to the Palestinians. The Palestinian negotiators apparently were willing at that time, as I was told in another Ramallah office, to cede only two, not three, of these settlement areas. UPDATE: a Palestinian official in Ramallah told me today, however, that it was the opposite — the Palestinians had rejected [not accepted] two out of the three concessions. A Palestinian official in Ramallah told me this afternoon, however, that their team had refused to cede both Maale Adumim [which is half-way from Jerusalem to the Jordanian Border at the Dead Sea] and Ariel [which goes 22 km deep inside the northern West Bank] . He indicated that there was Palestinian willingness to give up some part of Gush Etzion in the south, a part that is near the 1967 Green Line. In fact, he said, the Palestinians have rejected the idea of “settlement blocs” and are only willing to talk on a settlement-by-settlement basis. He also said, as he said before, that Ehud Olmert wanted to take 6.5% of the West Bank, and was offering 5.8% territory in exchange, with compensation of just over 1% somehow. What the Palestinians have proposed — and the map that the Palestinians have presented, which is not the Abbas-drawn map [above] of the Israeli proposals — is a 1:1 exchange of 1.9% of West Bank land. “President Abbas did draw a map”, the official added, “but I’m not sure this map is the map the President drew”. He said that professional cartographers working with the PLO then made a projection of Abbas’s drawing on a topograpical map of the West Bank… Then the Palestinian negotiators later presented their own map, which the U.S. government has officially received. UPDATE: The Times of Israel reported here that “According to Walla, Olmert envisaged relinquishing Israeli territory on a one-for-one basis to the Palestinians in areas including near Afula; near Tirat Zvi south of Beit She’an; north of Jerusalem; in the Judean Desert, and in the Lachish area. He also endorsed a tunnel route to link Gaza and the West Bank. Olmert, as he has subsequently confirmed, was also prepared to divide Jerusalem into Israeli- and Palestinian-controlled neighborhoods, and to relinquish Israeli sovereignty at the Temple Mount and the entire Old City. He proposed that the ‘Holy Basin’ be overseen instead by a five-member, non-sovereign international trusteeship, comprising Israel, the PA, Jordan, the US and Saudi Arabia”. Palestinians say that Netanyahu’s negotiator Yitzhak Molcho has since introduced the idea that Israel should be allowed to keep a security corridor all along the Jordan [River] Valley, carving out a large slice that would remain under their control. Mohammad Shtayyah said after a series of direct contacts in Amman in January 2012 that Molcho said, “Give it to us, or we’ll take it”… And President Abbas has complained to a number of visiting American and Israeli delegations about Israel’s Jordan Valley ambitions.